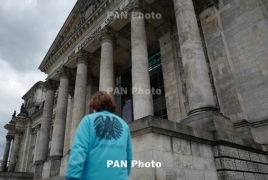 PanARMENIAN.Net - The German Bundestag on Thursday, April 4 evening ratified the Comprehensive and Enhanced Partnership Agreement between Armenia and the European Union. The Foreign Affairs Committee of Germany's Federal Parliament had approved the agreement on Wednesday and offered the parliament to adopt the law ratifying the document without amendments. The European Parliament, Luxembourg, Great Britain, Romania, Denmark, Bulgaria, Poland, Estonia, Latvia and Lithuania have so far ratified the CEPA.